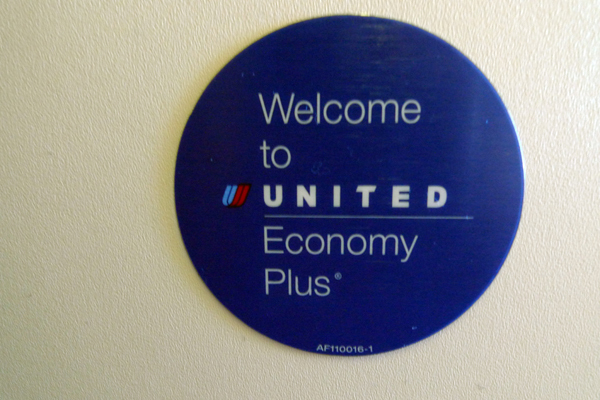 I'm flying off to Hong Kong on United Airlines. We choose this airline not because we were able to get the tickets at a good price (SGD$400+) but primarily because it is the only airline that fly at 6.50am to Hong Kong. That means we will reach Hong Kong at about 11am. This saved us quite a bit of time as it will be just nice to check-in to the hostel and have the rest of the day to explore. 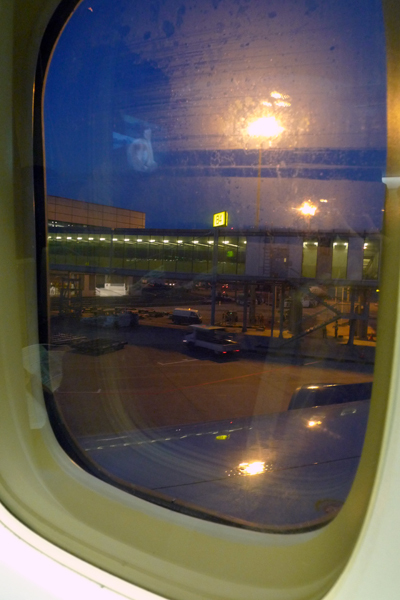 With 6.50am flight, the environment is still pretty dark when we board the plane. Next to UA, I see SIA. We were given the Economy Plus seats. Don't know what's the difference with Economy seats. 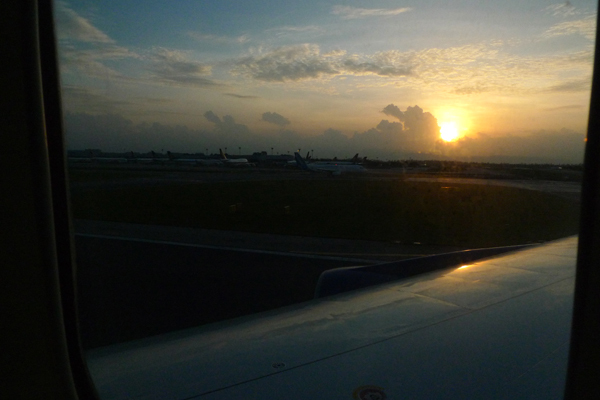 As the plane leaves the gate for the runway, the sun began to rise. It was a beautiful morning sky. 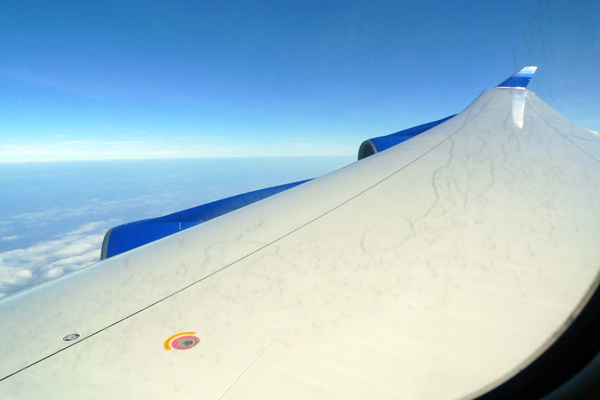 View of the plane's right wing in the nice blue sky. 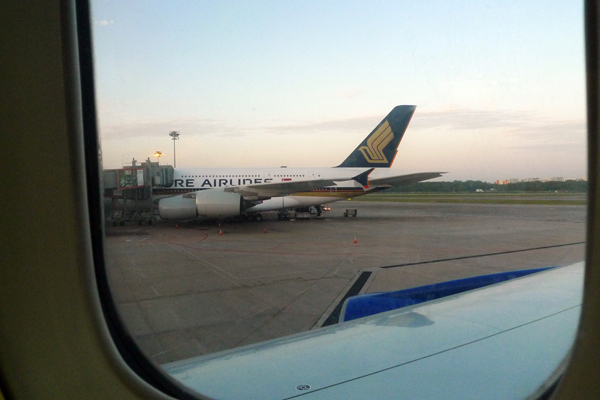 The journey from Singapore to Hong Kong takes about 3 hour plus a bit. 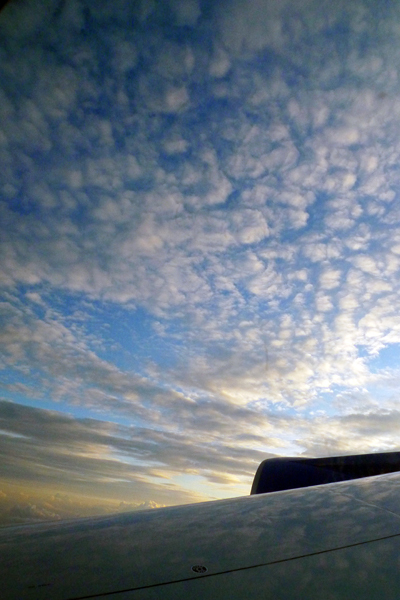 The sky was too bright for the passengers to open the windows and enjoy the view. Furthermore, the windows at my seat were at awkward location that I had to bend near to the front seat to look through it. On-board, they were showing Mosters vs Aliens. 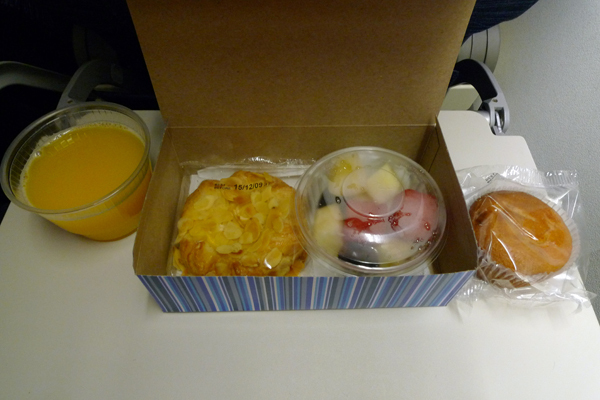 I got board reading magazines and took a 1.5 hr sleep while listening to on-board Jazz station. Reached Hong Kong airport and the first thing was to look for toilet. To get to the immigration, we had to take the internal tram as the gates were too far from the immigration center. At the Hong Kong Airport, I purchased the Octopus card (Ez-link card in Singapore's sense).